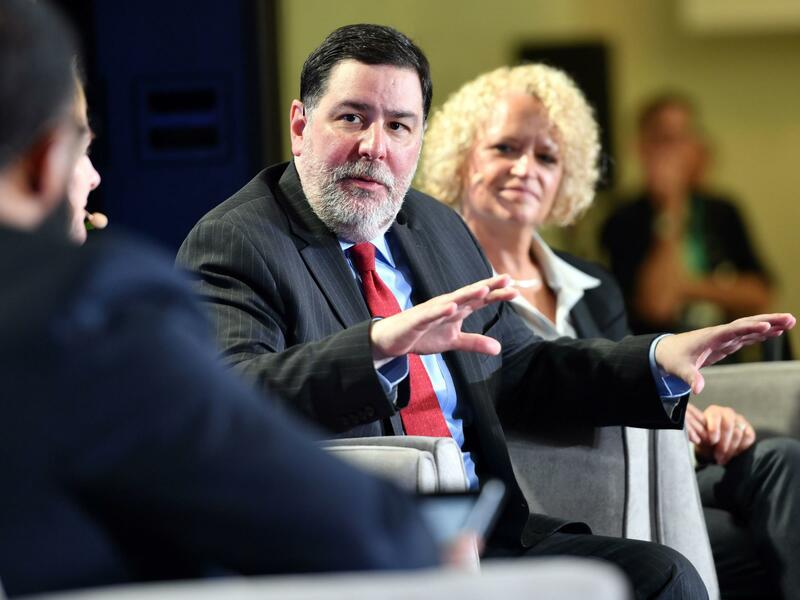 Pittsburgh Mayor Bill Peduto at a city climate action event in San Francisco in September. Peduto is representing U.S. mayors at the United Nations climate meeting underway in Katowice, Poland, this week. Leaders from nearly 200 countries, including the United States, are at a big climate conference in Poland this week. They are struggling to agree on rules for how to meet their national promises to reduce greenhouse gas emissions under the Paris climate agreement of 2015. The official U.S. position is making it difficult. The Trump administration is touting the importance of fossil fuels, refusing to acknowledge basic climate science that humans are causing the globe to warm, and generally reminding everyone at the meeting that the U.S. intends to back out of the Paris Agreement. But another group of U.S. leaders is also represented at the meeting: governors, mayors and other local authorities who say they are committed to reducing greenhouse gases even if the federal government is not. "I think it's important to show what civil society thinks," says Carla Frisch, a climate analyst at the Rocky Mountain Institute think tank who works with the coalition of local officials. She and others from the coalition have met formally this week with the governments of France, Germany and a group of island nations that are already feeling catastrophic effects of climate change. "I think it reminds them that the U.S. is serious about reducing emissions," Frisch says. "We do have, maybe, a peer pressure role on the international scene." And, she says, it's a reminder to other governments that their own citizens and local officials might want them to commit to strong international climate policies. The coalition was initially created after President Trump's 2017 announcement that the United States will withdraw from the Paris Agreement. A handful of local authorities are in Poland representing their own states and cities for the meeting, including officials from California, Washington state and Pittsburgh, Pa.
"Most people would expect the mayor of Berkeley or Boulder or Burlington to be here," says Pittsburgh Mayor Bill Peduto, "but I think there's a different message that comes out when the mayor of Pittsburgh is here. It sort of says 'Hey, the water's warm. If Pittsburgh can do it, we all can do it!' "
This is Peduto's third time attending an international climate meeting. He says Pittsburgh's history as a city built on coal and steel but now moving away from industry makes him a good representative to the meeting. Under Peduto, Pittsburgh has pledged to transition its city government's energy use to entirely renewable sources by 2030, and decrease its overall energy use by half. The first report on the city's progress will come in 2020. Pittsburgh has made some progress decreasing air pollution from industrial sources and vehicle emissions. "There are more than federal governments at stake now, and the subnational level is really where it's going to get implemented anyway," he says. "It's really nice when nations sign documents, but what it really comes down to is what we do in our own neighborhoods and what we do in our own cities." In his opening remarks at the United Nations climate meeting, U.N. Secretary-General António Guterres echoed that sentiment. "Most of the more important decisions that are taken in the country are no longer taken at the government level," he told assembled national representatives, but "are taken at regional and local level." "Mayors, governors, heads of regional governments — it's at that level that I see more and more the key decisions being made that change the lives of people and address the challenge of climate change," Guterres continued. Although their leaders chose not to fly to Poland to attend this year's international summit, the leaders of other American cities are also increasingly involved in climate policy. The city of Los Angeles, whose Mayor Eric Garcetti co-chairs a group called Climate Mayors, is spending more than $100 billion to expand the city's train system, and the city is publicly tracking its greenhouse gas emissions. Houston Mayor Sylvester Turner, who co-chairs the group, announced in September that the city is working on a plan for how Houston can be net carbon neutral by 2050, says Lara Cottingham, chief sustainability officer for the city. The details of that plan will be finished by this time next year. Despite such actions and pledges, the scientific reality is that emissions are not falling nearly enough. In fact, in 2017 greenhouse gas emissions grew for the first time in three years, and the world is not on track to avoid the most serious effects of climate change. In an interview with NPR's All Things Considered on Tuesday, outgoing California Gov. Jerry Brown said governments big and small are not being ambitious enough about moving to an economy that does not depend on fossil fuels. "The climate danger and damage is much greater than people are talking about, and it's going to get here much sooner," he said. "I'm sure that the political leaders will respond after we have four or five more disastrous fires, or four or five floods and hurricanes." The delay will cost the U.S., he warned. "The problem is the cost will be much higher and the political wreckage that much greater, because the burden of spending to transition to a noncarbon world will be much higher, much harder and [more] wrenching to the democratic political system." Trump administration officials at the international climate meeting in Poland have spent the week questioning basic climate science. But there is another group of Americans at the conference who accept it - local and state leaders. As NPR's Rebecca Hersher reports, they're taking an active role in looking for ways to combat climate change. REBECCA HERSHER, BYLINE: In the summer of 2017, President Trump announced that the U.S. was planning to back out of the Paris climate agreement. Carla Frisch is a climate analyst at the Rocky Mountain Institute think tank. CARLA FRISCH: That caused a lot of anxiety both domestically and abroad. And it really brought up two questions. Is the U.S. still doing anything on climate? And do those efforts still have significance? HERSHER: And one answer to those questions came in the form of a massive coalition of state and local governments. In the last year and a half, about 400 U.S. cities and a third of states have announced that they plan to drastically reduce their greenhouse gas emissions. And Frisch says they're actually having high-level meetings with other nations. They've met formally with the governments of France, Germany and a group of island nations and informally with others. FRISCH: I think it reminds them that the U.S. is serious about reducing emissions. So we do have maybe a peer-pressure role on the international scene. HERSHER: The U.S. coalition is formally led by the governor of California, Jerry Brown, and former New York mayor, Michael Bloomberg, big fish when it comes to American politics. But they're not in Poland. Instead, Mayor Bill Peduto of Pittsburgh is here. BILL PEDUTO: Most people, they would expect the mayor of Berkeley or Boulder or Burlington to be here. But I think that there's a different message that comes out when the mayor of Pittsburgh's here. It sort of says, hey, look. The water's warm. If Pittsburgh can do it, we all can do it. HERSHER: Pittsburgh, heartland home of coal and steel - or it used to be. Peduto says, today, Pittsburgh is transitioning to a cleaner, greener economy. They've pledged 100-percent renewable energy use by the city government by 2030, among other things. The first official report card will come in 2020. Other American cities, like Orlando and Columbia, S.C., have similar policies. And all these cities are in a race to be green. PEDUTO: And if there's something I can say about cities across the United States or across the world, they're competitive, very, very competitive. And they want to be able to show that their city or their region leads in different ways. HERSHER: In Poland, Peduto has met with, among others, leaders from Bonn, Germany, Oslo, Norway, and the host city, Katowice, the coal capital of Poland. He says they're all hoping that their national governments will negotiate rules this week that make it easier, not harder, to stop using fossil fuels. But they're ready to keep acting on their own either way. PEDUTO: It's really nice when nations sign documents. But what it comes down to is what we do in our own neighborhoods and what we do in our own cities. HERSHER: So far, this meeting has been a real struggle. Countries are behind schedule in the negotiations. In an address to national leaders, U.N. Secretary General Antonio Guterres said cities and regional governments will have to be a big part of the solution. ANTONIO GUTERRES: My strong appeal to all those that are here represented - regional, local governments, the business community, the civil society, the cities - to all of you is do not give up. HERSHER: And, he said, put pressure on national governments to be ambitious about climate change. Rebecca Hersher, NPR News, Katowice, Poland. Transcript provided by NPR, Copyright NPR.